Skype has been updated to version 2.1 build no. 23 (2.1.0.23) and now its compatible with Nokia Belle FP1 Smart Phones. You can make free Voice / VOIP calls through Skype over 3G / WiFi connection. You may also send files, share pictures and videos right from your Smart Phone. There is no video calling support as for now, in this version. 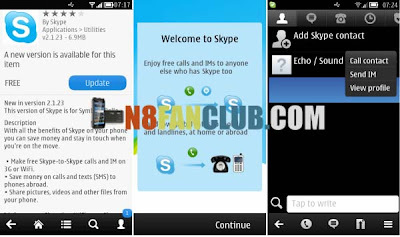 With all the benefits of Skype on your phone you can save money and stay in touch when you’re on the move.• Make free Skype-to-Skype calls and IM on 3G or WiFi.